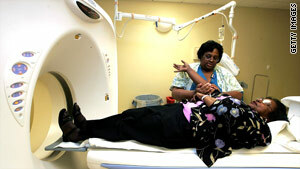 CT scans and other tests are still necessary and shouldn't be avoided, the study author said. (Health.com) -- Heart attack patients are exposed to a radiation dose equal to about 725 chest X-rays over the course of their hospital stay, according to research presented Monday at the American Heart Association meeting in Orlando, Florida. The radiation comes from tests such as computed tomography (CT) scans, cardiac catheterizations, and artery-clearing angioplasties. Too much radiation can increase the risk of developing some cancers, although the benefits of such tests typically outweigh the risks when it comes to diagnosing and treating heart attacks. The cancer risk associated with an angioplasty or with a CT scan -- which delivers about 500 times more radiation than an X-ray -- is hard to measure. Prashant Kaul, M.D., the lead study author and a cardiovascular fellow at Duke University Medical Center, in Durham, North Carolina, stresses that many cardiac tests that use radiation are necessary and appropriate. "We're not saying those should be withheld," he says. "We're just trying to increase awareness so that when physicians are ordering tests, they bear in mind the indications." The study, which was conducted over three and a half years, included nearly 65,000 heart attack hospitalizations at 49 academic hospitals across the United States. The researchers estimated radiation doses by looking at hospital records; they didn't measure exposure directly. A single radiation-delivering test generally poses little cancer risk, but the heart attack patients in the study averaged about four such tests during their hospital stay, potentially multiplying the risk. Angioplasty (also known as percutaneous coronary intervention, or PCI), a procedure in which a balloon-tipped catheter is used to open a blocked artery, delivers a dose of radiation about 750 times greater than an X-ray, but that doesn't mean doctors shouldn't perform it, says Kaul. "No one would argue that you shouldn't do that -- it's a lifesaving procedure," he says. Thomas C. Gerber, M.D., Ph.D., a professor of medicine and radiology at the Mayo Clinic's College of Medicine, in Jacksonville, Florida, says "it's difficult to assess the health risk of ionizing radiation." It's unclear if there's a risk associated with a radiation dose less than 100 millisieverts, which is an amount of radiation about seven times greater than the average dose seen in the study, says Gerber. "If there's an increased risk of cancer, it's small, and nobody's been able to show it," says Gerber, who has studied radiation safety in medical testing but was not involved in the study. The patients in the study were exposed to about 14.5 millisieverts, a dose roughly five times greater than the amount of exposure from so-called background radiation in the environment. The U.S. Food and Drug Administration (FDA) has estimated that the amount of radiation absorbed by the body during a CT scan increases the lifetime risk of dying of cancer by a factor of 1 in 2000. The natural risk of dying from cancer is about 1 in 5, so the added risk posed by the radiation is very small. According to the FDA, the benefits of a CT scan generally outweigh the risks for those with a medical need, but not for symptom-less people who are considering a CT scan only for screening purposes. According to Kaul, physicians should take into account a patient's total radiation exposure during a hospital stay, rather than the dose from one individual test. Exposure to radiation during occasional tests is safer than a relatively large dose in a short period of time, experts say. "Having 17 millisieverts in January and another 17 millisieverts in October isn't the same as having 34 millisieverts all at the same time," says Gerber. "Small amounts of radiation in certain increments don't mean the same as one large dose of radiation at the same time." Patients shouldn't be afraid to ask their doctor if a test is truly necessary, he says. "There's nothing wrong with patients asking their doctor, 'How will this test change what you do for me?' If it doesn't, that test may not be necessary." Heart attack patients shouldn't forgo a test simply because of concerns about radiation, says Kaul. Doing so could prevent doctors from diagnosing a dangerous problem or treating a patient to the best of their ability. "We don't want to scare people into thinking they're going into the hospital and their risk of cancer's going to suddenly increase," says Kaul. "It's a balance between the hypothetical risk of cancer with the risks of not performing an imaging study." At the American Heart Association's annual Scientific Sessions meeting, more than 20,000 cardiologists and other physicians from around the country give presentations on new research and on advances in the diagnosis and treatment of heart disease and stroke.